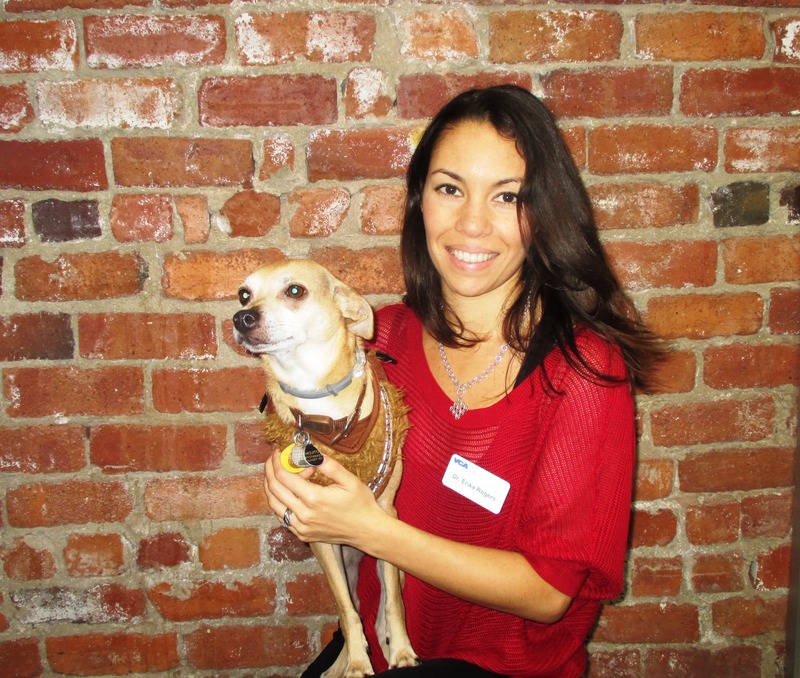 Learn a little more about the veterinarians and staff at VCA SFVS in our staff spotlight series! Favorite part of your job? Getting to cuddle with all kinds of doggies and kitties! I especially love the old, cranky ones. Tell us a little bit about yourself: I grew up in India and moved to the U.S. in 2004, when I met my husband. I have always loved animals, but it was not till after I moved to the U.S. that I was exposed to really high-quality veterinary medicine. I did research at UCSF for a while before deciding to pursue my one true passion in life and was very happy when I got accepted to the DVM program at UC Davis. I could not be happier with my decision and love every day at work! I hope to someday go back to India to work with the stray animals there and bring back my knowledge and skills to attempt to make their lives a little better. What do you most want to gain from your internship at SFVS? I want to learn as much as I can from all the wonderful clinicians at SFVS and really grow as a veterinarian. I truly believe in a holistic approach to animal health care and hope to incorporate that in my day-to-day practice. 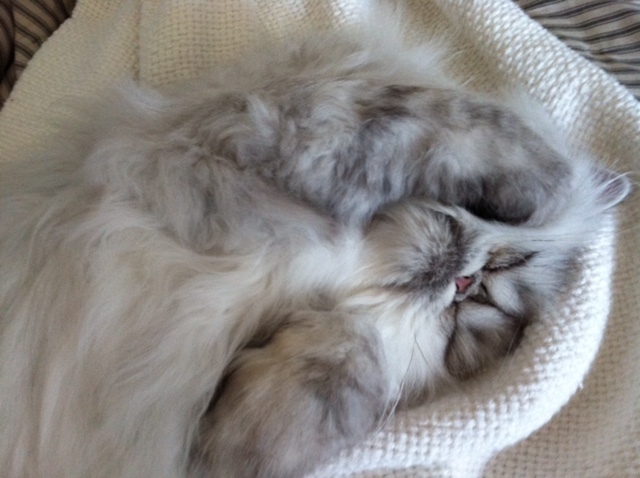 I am especially interested in the care of geriatric animals and their quality of life. A patient you’ll never forget? A very sweet miniature schnauzer from my senior year at vet school. He was the best patient I’ve had; he always greeted me with kisses every morning even though he was a very sick boy. Sadly he is no longer with us, but he will always be in my thoughts. Exciting new developments you’d like to share with pet parents? I have been working with a few veterinarians in the rapidly growing field of physical rehabilitation for dogs. My own dog does rehab every week for her arthritis. I am amazed at the results and would like to put it out there that there are several options for dogs in pain from chronic arthritis other than just pain medications. Some of the modalities I have worked with are cold laser therapy, underwater treadmill, at-home muscle strengthening exercises and acupuncture. I believe that these modalities help to improve the quality of life of senior pets, and it would be great if pet owners could incorporate some of these modalities into the care of their animals. Any animal companions of your own? A wonderful old lady golden retriever. She is the love of my life (other than my husband of course!). What do you enjoy doing outside work? I love gardening — I have a little organic garden on my patio. Someday I want to be able to grow my own food and have a little farm with donkeys, goats and of course lots of dogs and cats (all rescues!). Favorite animal-related activity in the Bay Area? Going to the beach with my dog and hiking in the Marin Headlands. Favorite TV show? I am a big fan of British murder mysteries on Netflix! 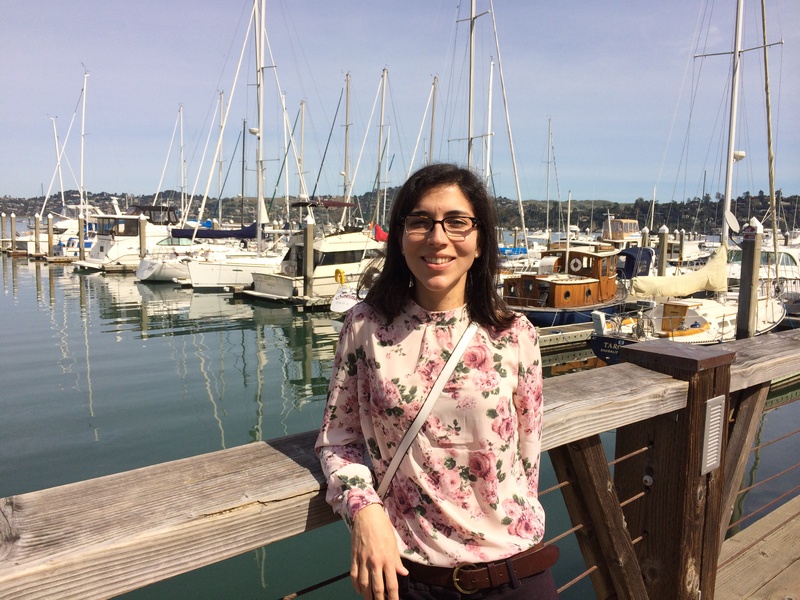 Introducing Dr. Maria Soltero-Rivera! A board-certified dentist, she is partnering with Dr. Molly Zacher to offer dentistry and oral surgery services at SFVS Monday to Friday. Our dentistry team operates on referrals from primary care veterinarians. With only about 150 board-certified veterinary dentists in the country, we’re excited to welcome one to the team here at SFVS. 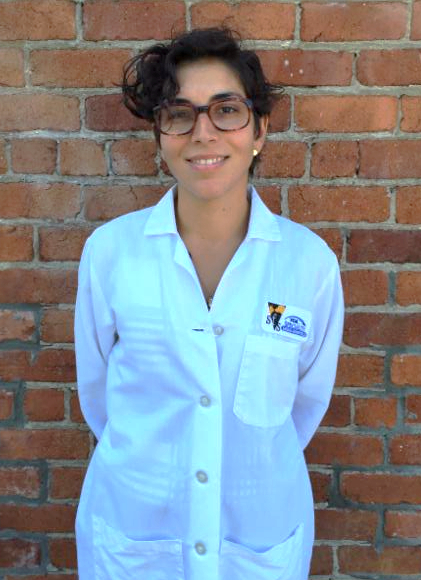 Dr. Soltero-Rivera looks forward to working with primary care veterinarians in the community, patients and clients. 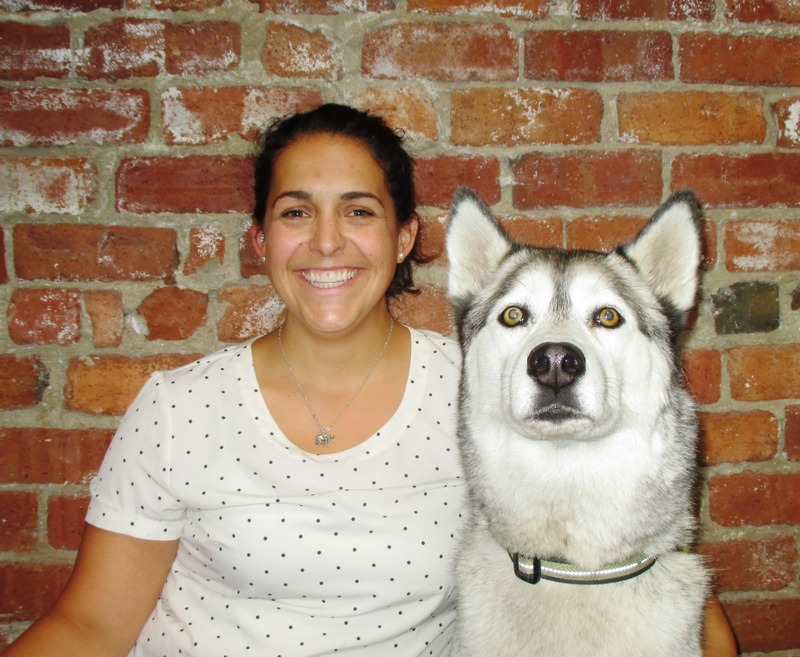 Dr. Maria Soltero-Rivera received her DVM from Cornell University. After that, she returned to her native Puerto Rico for a year-long small-animal surgical internship at Veterinary Specialty Hospital in San Juan, followed by a small-animal rotating internship at Long Island Veterinary Specialists. A board-certified veterinary dentist, she recently has spent her time lecturing at the University of Pennsylvania School of Veterinary Medicine, which is where she completed her residency in dentistry and oral surgery. Clinical interests include diagnosis and treatment of oral tumors and oral and maxillofacial trauma repair. 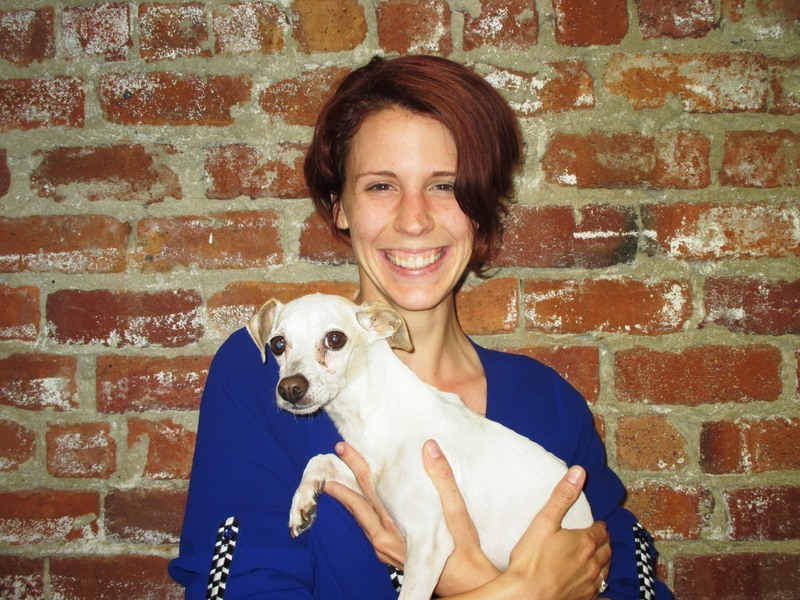 When not working, she can be found playing at the beach with her 2-year-old, Aurora; her husband, Bernardo; and their two Chihuahuas, Olivia and Pickles. She also loves cooking, reading and running. Maria can probably spill the beans on her famous brother’s magic tricks after all those years of being his lovely assistant. What is a Diplomate of the American Veterinary Dental College (AVDC)? Favorite part of your job? Procedures! I love having the chance to work with my hands to repair wounds, place sutures, and search for foxtails. Work background: I worked in SF as a veterinary assistant at the SF SPCA for several years before heading to veterinary school. I also spent some time working in research labs for alcohol addiction in humans. I actually decided to work in the veterinary field during undergraduate school when a dorm floor-mate and I were discussing careers. We decided to become veterinarians on a whim! That floor-mate since became a human nurse, but I stuck to the plan and I’m so happy with where I am now! What do you most want to gain from your internship at SFVS? Confidence with my medicine to provide the best and most practical care for my patients and their owners. What does your work day entail? It varies with what service I’m on: It can range from seeing stacked ER cases to helping with surgeries to going out to the community to provide basic veterinary care for pets of the homeless. Your work-related super power? I wish I could make several copies of myself so I could be in multiple places at once — that would be amazing! Any animal companions of your own? I have an 8-year-old female spayed border collie at home who loves to sit around and watch YouTube with me! We’re a definite match. What do you enjoy doing outside work? I enjoy working out — I make it a point to frequent the gym every day I have an hour or two free. I’m a big video game nerd and love playing when I get a chance. I also enjoy listening to Korean pop music. What book is on your nightstand? I’m really bad at keeping up with books — I’m addicted to YouTube! We are happy to welcome board-certified veterinary neurologist Tracy Sutton to our hospital, with her first day of appointments set for September 8! Dr. Sutton joins neurologist Dr. Lisa Klopp, who has been with SFVS since 2012, to offer 7-day-a-week neurology services starting this month. Dr. Sutton looks forward to meeting and working with primary care veterinarians, clients and patients. Welcome to the team, Dr. Sutton! Dr. Tracy Sutton joins VCA SFVS following a neurology and neurosurgery residency at Tufts University Cummings School of Veterinary Medicine, where she also earned her DVM. 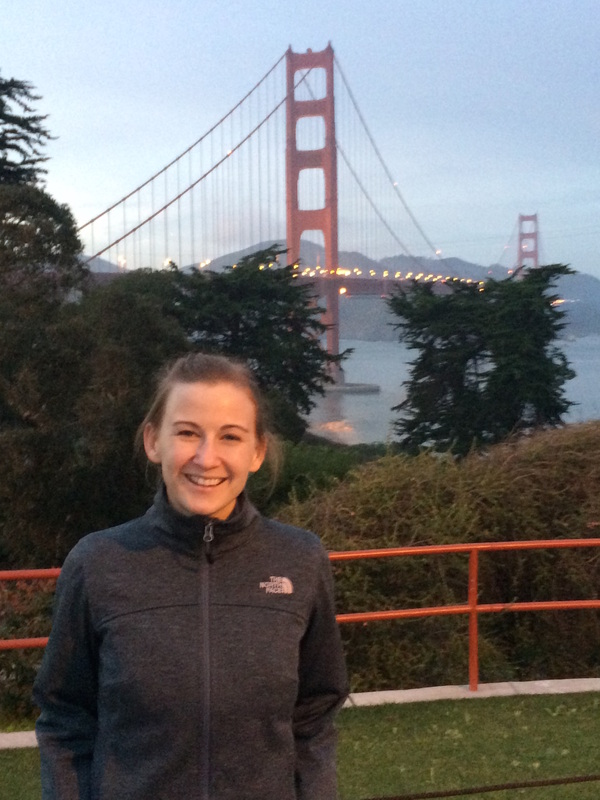 Originally from the Chicago area, Dr. Sutton looks forward to joining the San Francisco veterinary community. She is particularly interested in spinal neurosurgery, the pathophysiology and monitoring of intracranial pressure, and neurologic manifestations of systemic diseases. When not listening to the Blind Pilot radio station on Pandora or perfecting her Spotify playlists, she spends her free time outside hiking, reading books in the sun, or just driving around with the windows down. Transitioning from life in her native Chicago, and more recently Boston, Tracy looks forward to taking full advantage of California’s year-round sunshine. VCA SFVS Welcomes Our 2015–2016 Interns! 1-Dr. Andrew Espitia graduated with his DVM from the UC Davis School of Veterinary Medicine in 2015. Before vet school, he was a research assistant in various labs at UC Berkeley and UC San Francisco, and also worked as a veterinary assistant in general and emergency practice for two and a half years at the SF SPCA. 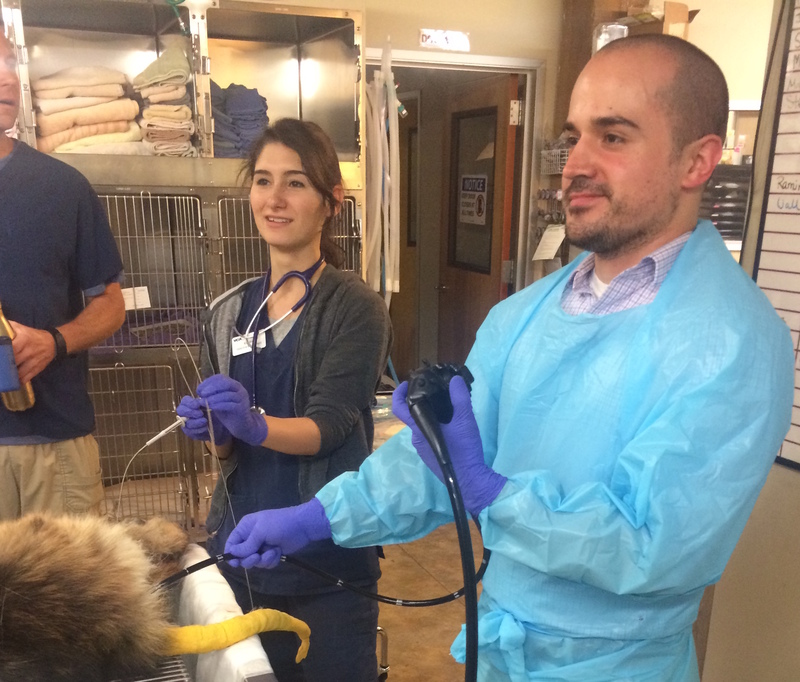 Dr. Espitia was vice president of his class at UC Davis and involved with the Feline Medicine Club, Canine Medicine Club and SVECCS. He is interested in emergency medicine and looks forward to working in the fast-paced environment at VCA SFVS. 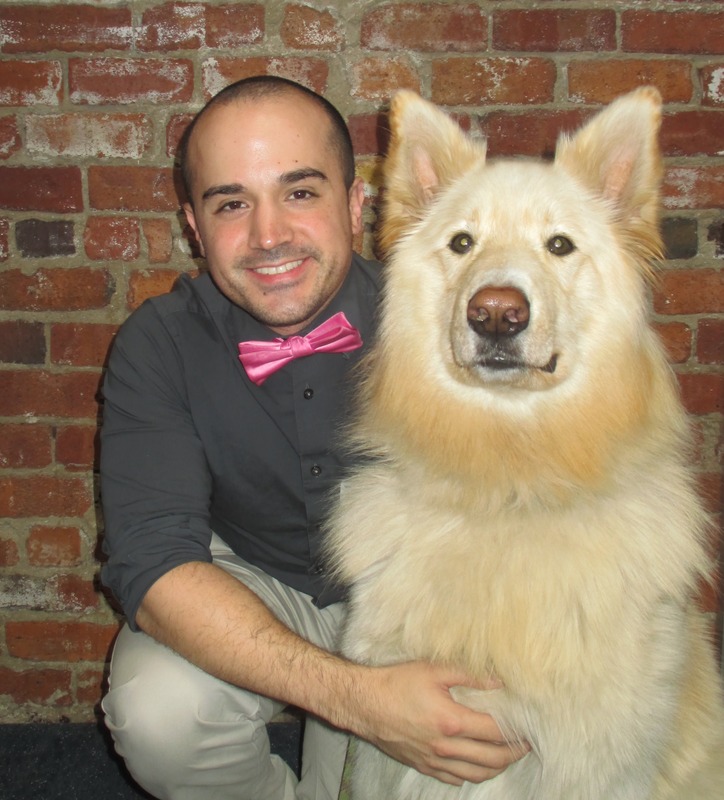 In his spare time, Andrew enjoys exercising at the gym, spending time with his couch potato border collie, and shopping for new and exciting bow ties. 2-Dr. Viru (Viranjini) Gopisetty is a 2015 graduate of the UC Davis School of Veterinary Medicine. 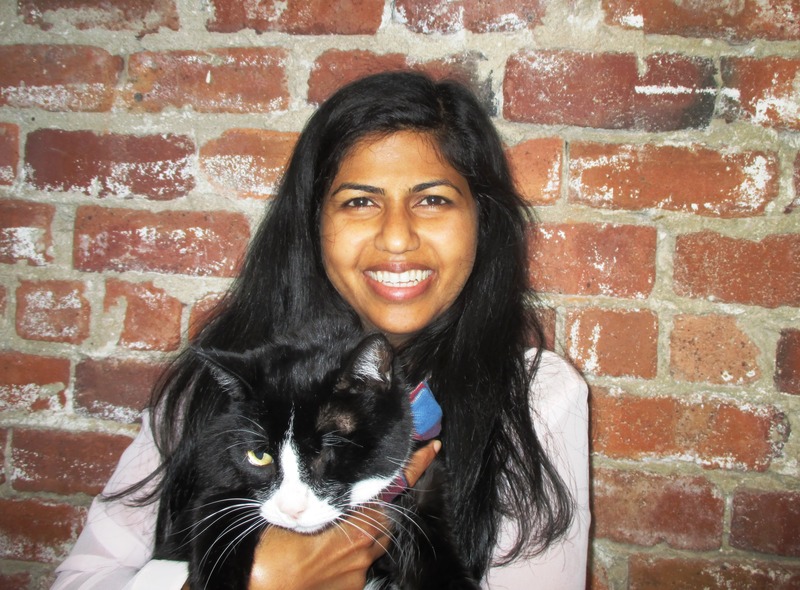 Originally from India, she moved the San Francisco Bay Area in 2004 and worked as a research coordinator at the UCSF Osher Center for Integrative Medicine before she decided to go back to school to earn her DVM. She volunteered at the SF SPCA and the SF Children’s Zoo before vet school. Dr. Gopisetty is passionate about geriatric medicine and shelter medicine, and she hopes to work internationally in the future. In her free time, Viru loves organic gardening, cooking, watching independent movies, and going to the beach with her husband, Sri, and their wonderful golden retriever, Sasha. 3-Dr. Claire Johnston grew up in Humboldt County and attended Cal Poly San Luis Obispo, where she received her B.S. in animal science in 2011. She graduated from Western University of Health Sciences, College of Veterinary Medicine in May 2015 and is excited to continue her studies at VCA SFVS and pursue her interest in internal medicine. Not only does Dr. Johnston enjoy small-animal medicine, but she also loves working with cows and horses. In her free time, Claire enjoys baking (particularly cupcakes), hiking and traveling, and she is currently working on acquiring her scuba certification. 4-Dr. Jayson Johnston was born on the sunny island of Guam and grew up in the overcast city of Seattle. He graduated from the University of Washington in 2011, where he studied biology and aquatic and fishery sciences. Next was veterinary school, which took him to the greater LA area, where he graduated from Western University of Health Sciences in 2015 with his DVM. Dr. Johnston is interested in internal medicine, ophthalmology, pain management and exotics. Outside the hospital, Jayson enjoys camping, cooking, flipping large rocks in tide pools, cutting his sandwiches diagonally and, most importantly, Sunday Funday. 5-Dr. Erika Rogers was born and raised in Lima, Peru, where she obtained her veterinary degree in 2007. She moved to San Francisco in 2008 to continue her education with a focus on small-animal medicine. She was a veterinary technician for a few local practices in the city while working on validating her license through the American Association of Veterinary State Boards Program for the Assessment of Veterinary Education Equivalence (AAVSB PAVE). In the unique position of being a practicing veterinarian in Peru, Dr. Rogers only needed to complete one year at Louisiana State University School of Veterinary Medicine to obtain her DVM license in the United States. Dr. Rogers has a professional interest in internal medicine, cardiology, dentistry and dermatology, and looks forward to studying these topics while at VCA SFVS. In her free time, Erika enjoys helping her husband develop and promote his start-up company, as well as hiking, wine tasting, and lounging at home with her cat, Jasper, and dog, Mojito. 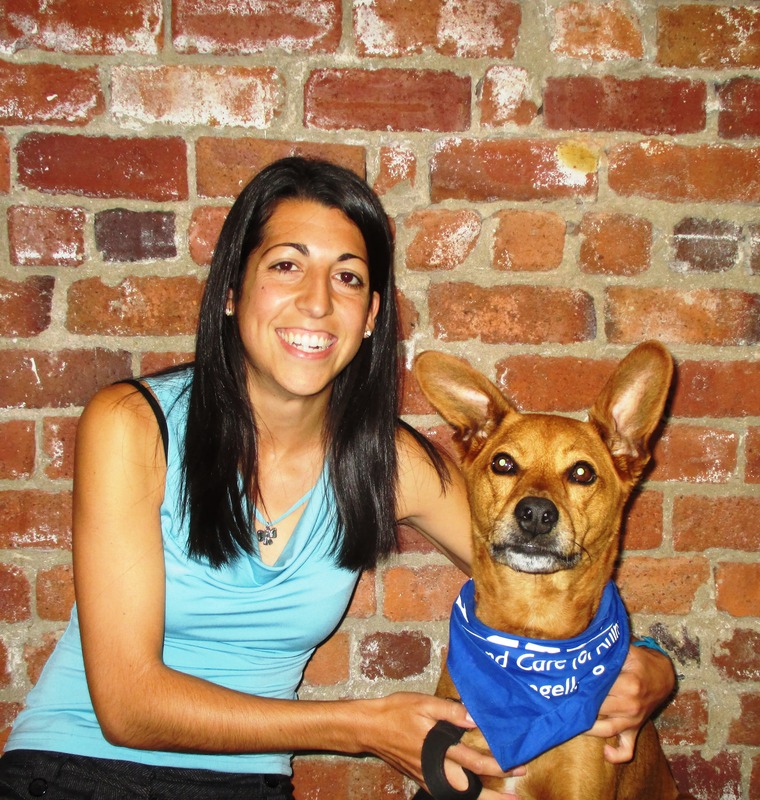 6-Dr. Lauren Silverman is a 2015 graduate of Western University of Health Sciences, College of Veterinary Medicine. Originally from Mountain View, she received her B.S. from Cal Poly Pomona with a major in animal science. Dr. Silverman is excited to be back in the Bay Area and to have the opportunity to enjoy and explore the beautiful city of San Francisco. She is thrilled to spend her first year out of school at VCA SFVS to pursue her interests in internal medicine, dermatology and neurology. In her free time, Lauren enjoys playing ultimate frisbee, biking around the city, and admiring the beautiful view of San Francisco from Bernal Heights with her 6-year-old mutt, Rufus. 7-Dr. Sarah Wallace was born and raised in the great state of New Hampshire (“Live Free or Die”). She attended Lafayette College (“Cur Non?”) in Easton, Pennsylvania, to attain her B.S. in biology. In May 2015, she graduated from Western University of Health Sciences, College of Veterinary Medicine. In her free time, Sarah enjoys playing with her blind flame point Siamese cat named Sonar, quilting and reading. Sarah can’t cook to save her life but loves Mexican food. Sometimes her dreams are set to the theme song from the show Twin Peaks, and, someday, she would like to ride a bike down US-1 from Maine to Florida if she can find a comfortable enough bike seat. 8-Dr. Jessica Wong was born and raised in beautiful San Francisco. She attended UC Santa Cruz, where she received her B.S. in neuroscience and behavior. She got her start with animals while volunteering at the local zoo and shelters before heading down to LA for veterinary school at Western University of Health Sciences. 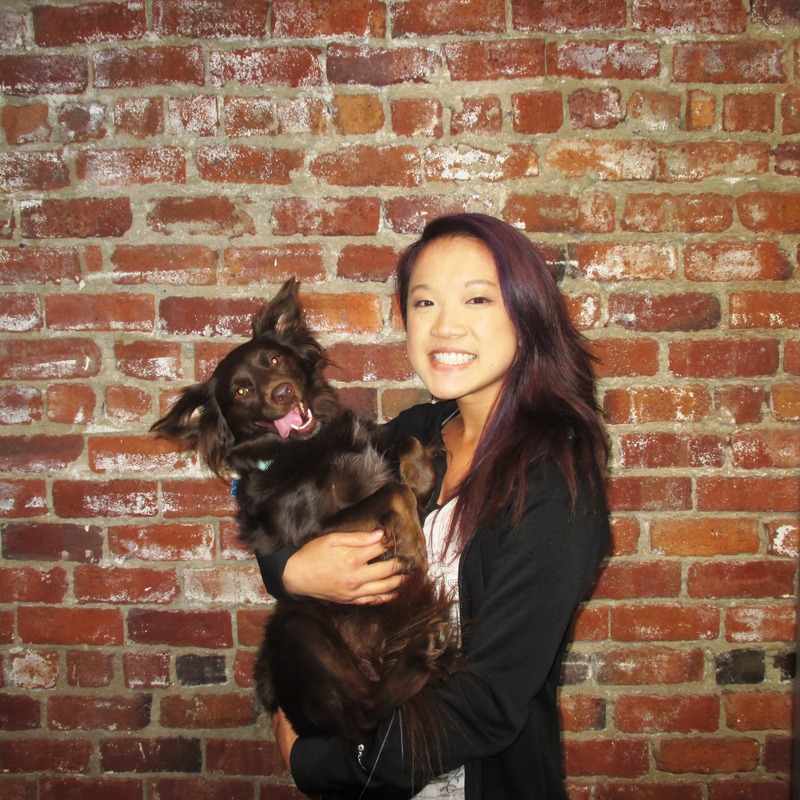 Dr. Wong is excited to continue her studies at VCA SFVS and pursue her interests in emergency medicine, shelter medicine and exotic companion animal medicine. In her free time, she loves cooking, baking and trying new foods with friends. She also enjoys hiking with her furry friend, Tiramisu, or relaxing at home with her ball python, Egg Tart. 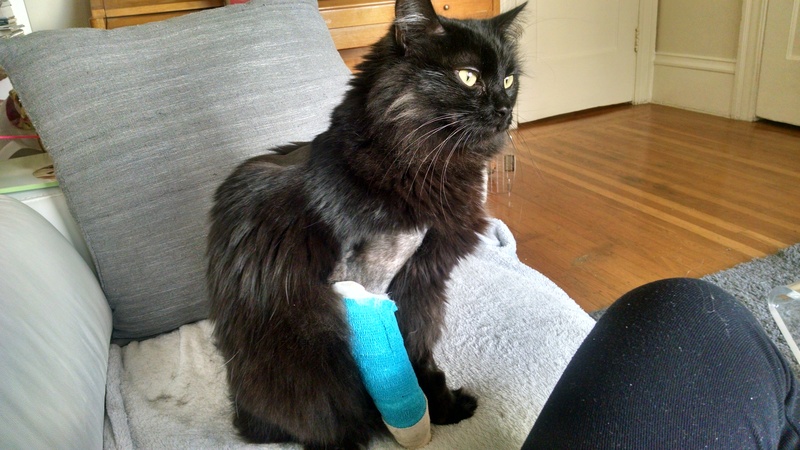 We met the adventurous Arnie when he needed surgery … after he’d jumped out his 4th floor window onto Geary on a Tuesday night! Arnie is quite the trooper, and we are happy to report that he is recovering nicely after this very scary experience. 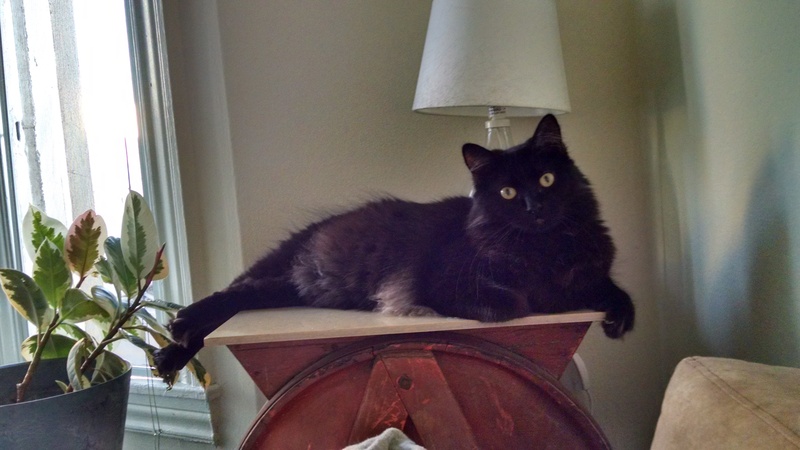 I adopted Arnie from the SPCA here in SF in May 2014. I knew he was the kitty for me when I walked into his cage and he came up to me and bit me. Arnie loves to run pell-mell through the apartment, knocking things over as he does so. He’s a real hell-raiser. He also really enjoys eating houseplants. He protects me from the pigeons outside by keeping a very close eye on them. I suspect he thinks he will one day catch one. He has a LOT of kitten in him still, so he’s into everything. … He’s a very good boy though, very sweet when he wants to be. I call him my little Puddin’ Pie. He doesn’t care for people food, at all, except for tuna of course. And sometimes spinach. He’s a weirdo. He LOVES playing in the bathtub after I take a shower. Takes toys in there and rolls around and has a general grand time of it. While I was in the kitchen, he pushed the screen out of the window (a custom screen I made, mind you) and jumped out the 4th floor window. I ran onto Geary in my pjs, with no shoes on, screaming his name. Luckily some bystanders had seen him hide under a parked car and directed me to him. 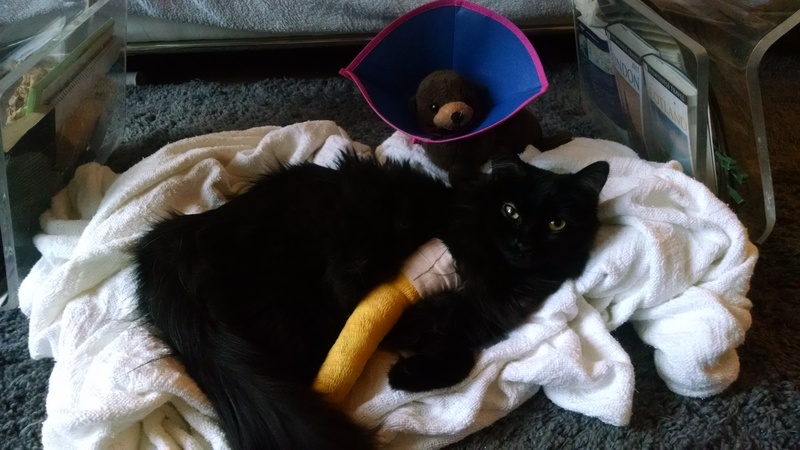 I immediately took him to the emergency vet … The next day they had me transfer him to VCA, as he had badly broken both bones in his front leg, in several places. They said it was a complicated case. Luckily, he only dislocated his jaw and they had been able to re-align it overnight. Dr. Watt was able to operate on him that day, thankfully. He now has “hardware” as they call it … pins/plates in his arm. Poor little guy is a real trooper. The first night I brought him home was pretty rough — I really didn’t get to sleep, but he quickly got better and was able to get around on his own and eat and drink on his own. Screens do not keep motivated cats in. Lesson learned. My next step is to reinforce them with chicken wire and attach them to the wall with screws and hooks so that they cannot be moved by anyone but me. Also, I now have pet insurance. Highly recommend VCA and Dr. Watt and Naomi. They have really provided excellent care and have been available for all my anxious questions. 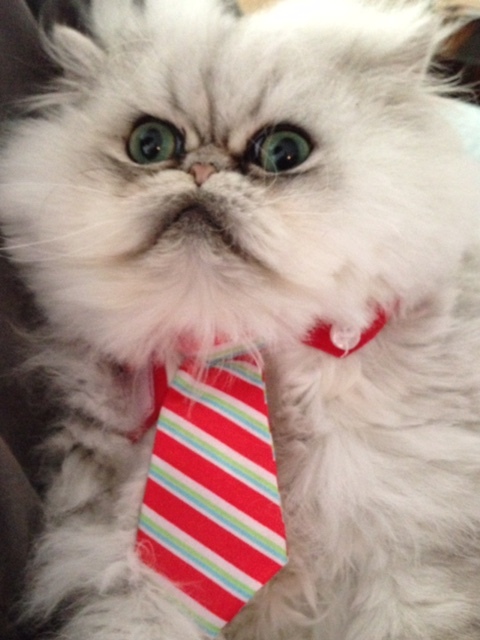 Many thanks to Tiffany for sharing Arnie’s story and photos with us! We wish Arnie all the best and hope he is satisfied to just enjoy the view from now on. 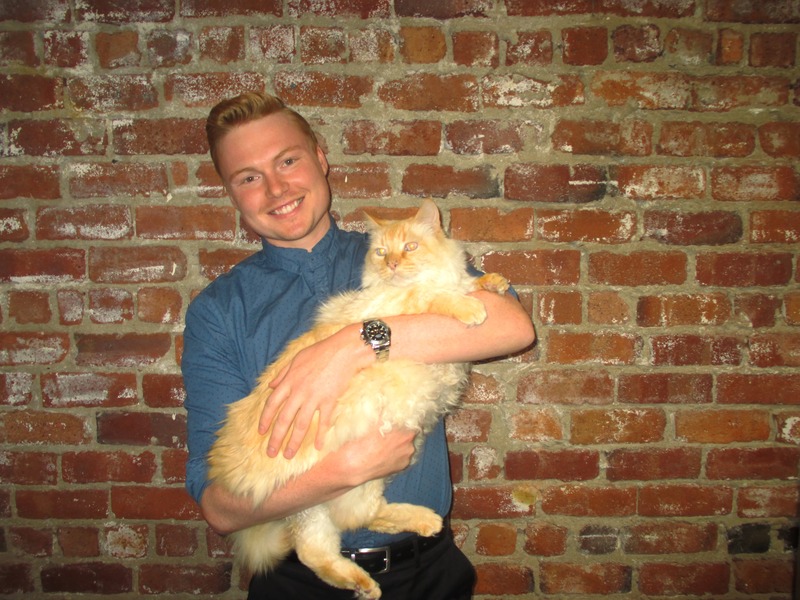 Today’s patient story features the amazing … Gus! 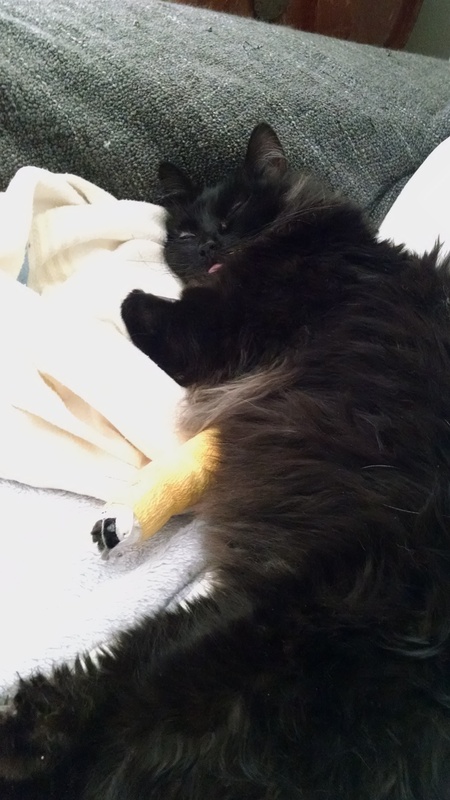 This affectionate kitty came to SFVS with an obstructed, fluid-filled space in his brain, which resulted in fluid backing up and compressing his brain tissue. This caused Gus to have seizures and undergo a behavioral change. SFVS veterinary neurologist Dr. Lisa Klopp used our onsite MRI to diagnose this condition. She then treated Gus by making a burr hole into his brain and letting the fluid drip out to equilibrate pressure. We are so happy to report that Gus is now doing well! Gus (or Gussie or even Guster if you prefer) is just a good-natured fellow. Never one to hiss and always one to cuddle, he is a vital part of our family. Gus loves to chase his feather toy and will carry the pole up and down the stairs meowing at a rather high volume until we put down what we are doing and play. 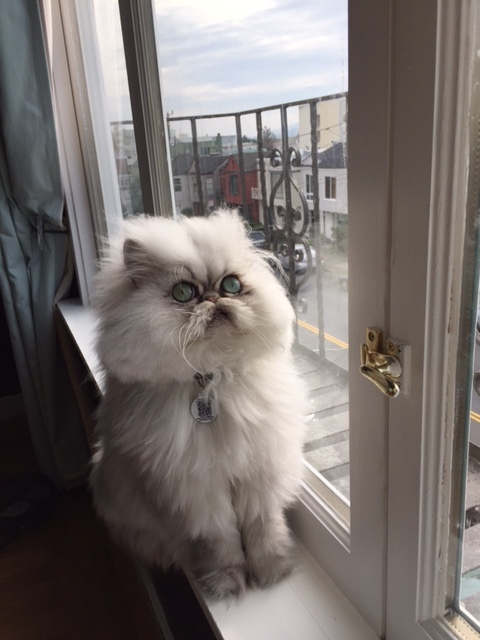 He also loves to watch the birds out the window and loves to partake in each and every tuna-flavored meal. 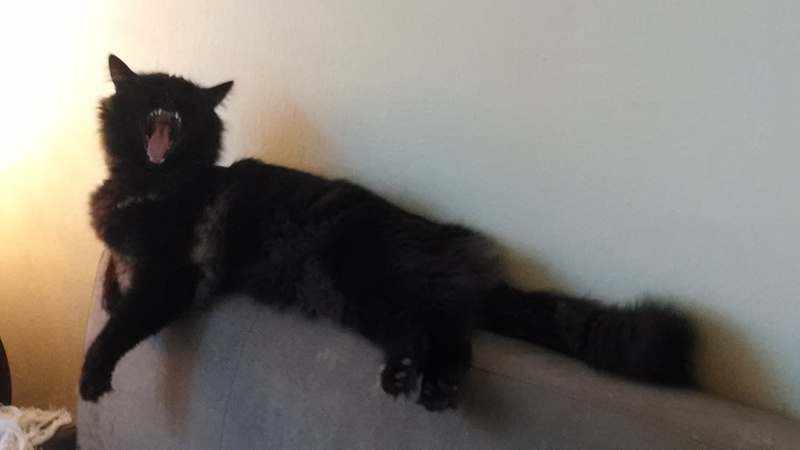 At only 2.5 years old, he has had all the pampering and love a kitty deserves, but unfortunately also a rough medical journey. With the care and skill of Dr. Lisa Klopp, we are lucky to be able to spend more precious years with Gus. We are so thankful for her and the rest of the VCA team that have taken such good care of Gus. Thanks to Shannon for sharing these photos and background on Gus. We are very grateful for our clients and patients! Have fun with that feather toy, Gus.